A cache latency calculation tool. L1 to L3 cache information: location, size, speed, technology. Anyone who expects their PC to be in tip-top shape must first and foremost be aware of its capabilities and potential, and for that, it’s best to employ a dedicated software utility. 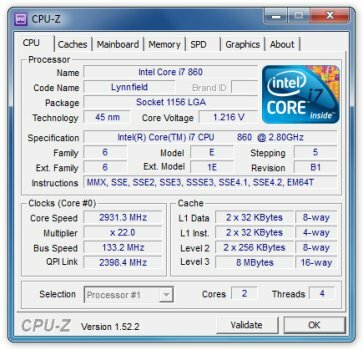 CPU-Z is one such application serving an informative purpose, what with its ability to reveal all sorts of details on your processor, memory, cores, and more, so that you know how to make the best of your computer. the Bench tab offers a real-time assessment of your computer’s performance. To be more specific, it can carry out a single- or multi-thread analysis, with the possibility of using a multitude of references in order to make relevant comparisons. CPU-Z offers a comprehensive evaluation of your PC’s capabilities that you can turn into HTML or TXT reports in the blink of an eye. The app has an almost invisible memory footprint, proposes a clear-cut user interface, and all the data it gathers is offered in real time, so all things considered, it has all the prerogatives of a reliable tool of its kind. Validate the authenticity of your current system settings by submitting it in the CPU-Z Database. It's simple and free: just use the "Validate" button within CPU-Z then click "Submit" for an instant, 100% automatic submission. You will receive a link to your complete system specs, including the validated status of your computer. The perfect way to share your awesome brand new hardware specs with your friends and, if something goes wrong, an invaluable tool to ask for some help on enthusiasts forums. CPU-Z Validation is also the world-recognized standard for certified Overclocking. Give you a chance to enter in our Hall of Fame!